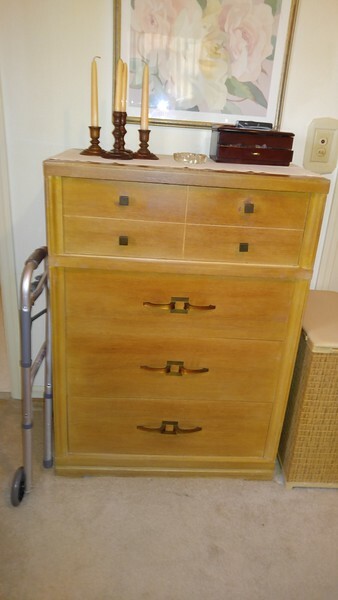 If you love mid-century modern furniture and accessories you will love this Estate sale! Come step back in time with the Kelly crew ! Below is a brief list of some of the items you will find at this sale. Plus tons of extras! *Master bedroom end of hall on right: mid-century modern bedroom suit. solid wood blonde furniture. headboard and footboard on Queen frame, gorgeous mirrored vanity, and chest of drawers. *Bedroom #1 first on left pair of solid Pine single beds with nightstand and chest of drawers with mirror. Awesome! *Dining Room mid-century modern dining room table & chairs, matching buffett! Exceptional! *Vintage Pair of Alexander Backer Company Chalkware Hip Moreau 18" Young French Maiden Girl with Scarf Statues Scultptures.Made by the Alexander Backer Co. these chalkware statues are reproductions of the works of the French Sculptor Hippolyte Francois Moreau (1832-1927). *exceptional mid-century modern floor lamp!! **A full house of goodies! come join the Kelly crew for this fun sale! We accept all major credit cards with a 3% service charge. If you are tax exempt please bring a copy of your certificate. If you do not have a copy of your certificate you will be charged 7% Georgia sales tax. Please don't get mad about the sales tax this is a business & by law we must charge sales tax. Check out more pictures to be posted in real time at the link below!